Perches should always be made of non-toxic materials. The household can be a dangerous place when you're only 6 inches tall. To keep your budgie safe, you need to provide a hazard-free environment in and out of his cage. Taking the proper safety measures for your budgie is a simple matter of planning and ongoing maintenance. Paint, glue and certain metals are dangerous for budgies, so make sure you don't give your bird anything potentially poisonous. For example, heavy metals like lead and copper are toxic to your budgie, while safe alternatives include stainless steel. Make sure that the bars of his cage and any toys you give him are made from safe, non-toxic materials -- even if he can't eat it, simply making contact with it can cause a bad reaction. Before you let your budgie out of his cage, check throughout your house to make sure no dangers await him. For example, a running ceiling fan, a hot stovetop or an open window all pose threats to his safety. If you're particularly concerned for his safety outside the cage, have his feathers professionally trimmed. This ensures he can still glide while preventing him from gaining the altitude that can lead to unsafe environments. Budgies are relatively sensitive to temperature, so extremes and frequent fluctuations can cause unsafe levels of difficulty in regulating his body temperature. His environment should ideally stay between 68 and 72 degrees Fahrenheit, and while a budgie can generally tolerate temperatures outside of that range, it shouldn't fluctuate. When the temperature in a budgie's environment isn't stable, he has difficulty maintaining a safe, healthy equilibrium. Air fresheners and scented candles may fill your home with the aroma of Christmas cookies and fresh linens, but they fill your budgie's lungs with chemicals. He's much more sensitive than you are to the chemicals that give aerosol sprays, plug-ins and other aromatic accents their scents. For the sake of his health, you shouldn't use any such scented products in the home -- especially not in the same room as your bird. Otherwise, his breathing and his safety will suffer. When caring for a budgie, you have to monitor not just his environment, but what goes into his body. Certain foods and ingredients, like chocolate, avocado, caffeine and the pits of certain fruits, are toxic to your bird. Even fruits and veggies, many of which are healthy and generally well-liked by budgies, can have hidden dangers. Dried fruits preserved with sulfur dioxide, for example, can cause discomfort and shedding. Fresh fruits and vegetables should be thoroughly washed before feeding, as well, to eliminate any surface pesticides. 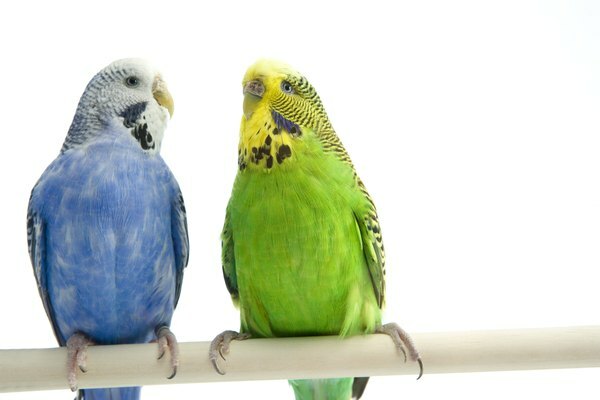 While budgies can live in the company of other pets, like dogs and cats, you have to be sure that your four-legged friends don't create a stressful or unsafe environment for your bird. The bird's cage should be kept in an area where people typically congregate whether or not you have another animal, just because budgies are social birds -- when you're home, then, you're able to command the dog or cat away from the cage. When you aren't home, though, or when you let your budgie out for cage-free socializing, keep the other animals closed off in another room so that they don't terrorize (or worse, catch) the little guy. Vet Street: How Can We Keep Our Bird Safe From Our Cat?